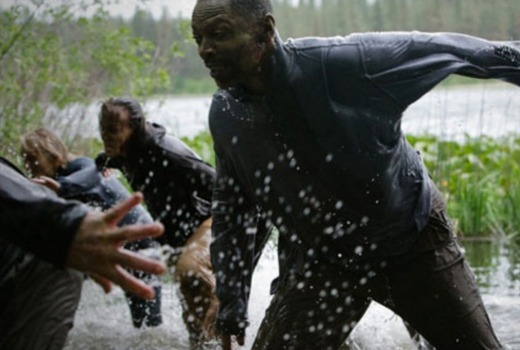 Next week Syfy premieres the latest zombie series, Z Nation. It features a group of survivors who must cross the country with a possible cure for the zombie apocalypse. Sound familiar? The cast includes Kellita Smith, DJ Qualls, Michael Welch, Keith Allan and Harold Perrineau (Lost, Oz) and guests include Kelly McGillis and Bill Mosely. It premiered in the US in September, and has been renewed for a second season. Forget the walking dead, these zombies can run. After surviving a zombie apocalypse, a group of the best and brightest fighters must transport the only known survivor of a zombie attack from New York to California. There the last functioning viral lab is waiting to develop a vaccine to save what’s left of humanity. Fill the zombie shaped hole in your viewing left by the end of TWD S5. It doesn’t take itself as seriously as Walking Dead, but is good no-brainer (forgive the pun) fun!